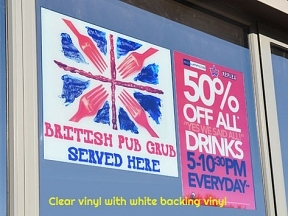 1) Apply digitally printed white vinyl to the side of the window that the graphic is being seen from, i.e. apply inside to view from the inside or apply outside to view from the outside. This method gives a bright colourful effect and is not affected by tinted glass as its viewed from the side its applied to. The two disadvantaged are: One, it is vulnerable to being picked, scratched and peeled off by vandals. Two, it is exposed to the weather if being viewed from the outside. Considering these two points its lifespan is likely to be compromised. 2) Static window cling is the easiest way to achieve window graphics, it has no glue and is fixed to the window by static only, the window must be ‘squeaky clean’ for this to work. As the material has no adhesive and relies totally on static, it can be removed and re-applied countless times if kept in good condition. This product can be applied to the window both ways i.e. print facing to the glass or away from the glass meaning you can display your graphics to be viewed the other side of the glass or facing into your window. Note this is not designed for a permanent solution. 3) Clear mirror print with white overprint, this method provides a permanent professional finish and still allows a degree of light through the window. 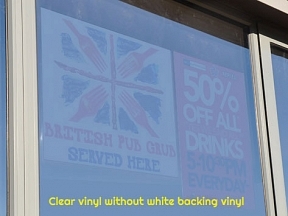 Clear vinyl is mirror printed and then overprinted in total white. The white overprint gives the contrast needed to allow your print to be vivid from the outside. This method is applied to the inside of the glass. This is generally the most popular choice for window graphics. We do have the option for ‘White vinyl backing’, with this you would also have a piece of white vinyl (unprinted) that would stick over your clear graphic after it has been fitted, the purpose of this is to prevent scratching on the inside and bring contrast to your print in a similar way to the white overprint. 4) One Way Vinyl – Mainly used on vehicle rear or rear side windows, note it is against the law to use this product on vehicle front windows including front side windows. One Way Vinyl is applied to the outside to be viewed from the outside, it is relatively easy to install and allows you to still see out of the window. One Way Vinyl is considered to be a short life product however we do know of it lasting in excess of 2yrs. It is not advisable to use window wipers when this product is used. Note: When applying window graphics inside a window to be viewed from the outside, tinted glass will make a difference to the brightness and vividness of the print. Window text is best achieved using cut vinyl methods, lighter colours like white & yellow stand out the best. Cut vinyl lettering and numbers can be mirror cut to stick inside to read outside or standard cut to read from the side it is being applied to.